COURTENAY, B.C- One man is in custody after three fires in Courtenay on Saturday. 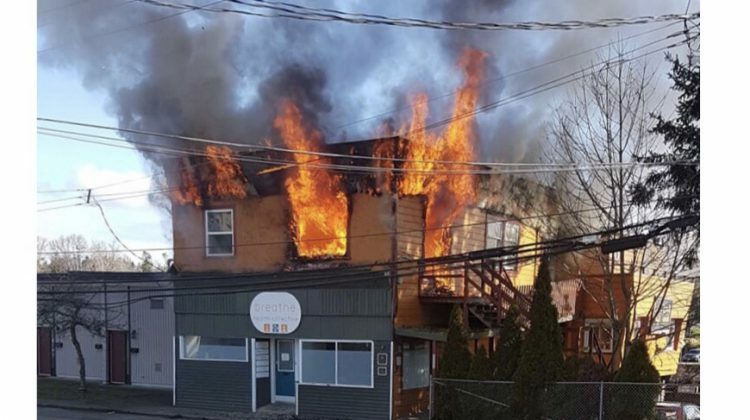 According to the Comox Valley RCMP, police were first called to the scene of a fire along Anderton Avenue in Courtenay around 10:15 a.m. That fire was an intense blaze at the Cona Hostel, which caused major damage to the building. While officers were at the hostel fire, another call came in about a fire at the intersection of 5th Street and Fitzgerald Avenue, and a third fire in the 600 block of Cliffe Avenue. That fire was at the HMCS Alberni Museum and Archives (HAMM). RCMP responded to a call after the museum reported someone had started a fire in front of their building. The fire was small, but damaged a brochure rack, and a window adjacent to the museum was also damaged. Bystander Graham Woods, said he saw a man light the fire, and leave the scene. “He had started a fire in the brochures and it was really starting to go, he looked at me and walked off like nothing had happened, it was either deal with him or put the fire out,” said Woods. Frontline members of the Valley detachment arrested one man, who is believed to be associated with one or more of the fires. He is still in custody, while the detachment’s Major Crime unit gather evidence. “There was likely a lot of witnesses in the area as these fires were occurring” said Constable Monika Terragni, Media Relations Officer for the detachment. “If you witnessed any suspicious behaviour, we are asking you to call and speak with our investigators” she added. Anyone with information can call the Comox Valley RCMP at 250-338-1321 and refer to file 2019-4051. If you wish to remain anonymous, you can call Crime Stoppers at 1-800-222-8477 (TIPS) or online at http://comoxvalleycrimestoppers.bc.ca/.